This Essay examines the vocation of the international arbitrator. I begin by evaluating, under sociological frameworks developed in literature on Weberian theories of the professions, how the arbitration community is organized and regulated. Arbitrators operate in a largely private and unregulated market for services, access to which is essentially controlled by what might be considered a governing cartel of the most elite arbitrators. I conclude my description with an account of how recently international arbitrators have begun to display a professional impulse, meaning efforts to present themselves as a profession to obtain the benefits of professionalization. Professional status is often used by groups to distinguish themselves, but with international arbitrators, their supposed professionalization is not a particularly compelling reason for distinguishing them from other service providers, such as lawyers. 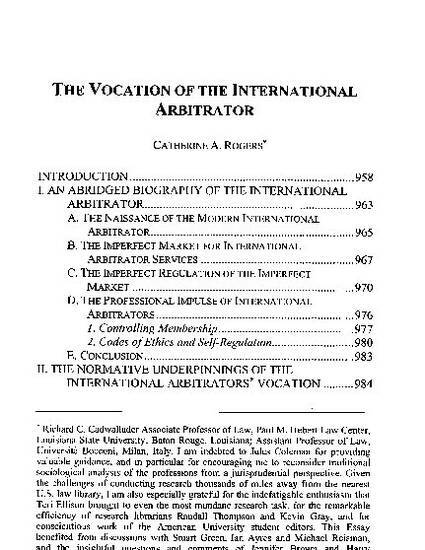 Instead of relying on the rubric of sociological accounts, I offer a preliminary conceptual analysis of the normative underpinnings of the vocation of the international arbitrator. I argue that, unlike settlement or mediation, the aim of international arbitration is to render justice, not to simply resolve disputes. I provide an overview of the ways in which the practice of international arbitration bears out this hypothesis through its development of a vibrant, if perhaps still fledgling, public realm. Finally, I return to the market for international arbitrator services and their efforts at self-regulation, evaluating them in light of obligations and expectations attendant with their justice-providing function and the public realm of the international arbitration system. I propose certain innovations that would increase the rigor and transparency in international arbitrator's self-regulation, including minimizing existing information asymmetries that affect the market for arbitrator services. These improvements may be regarded as having been implicitly promised through their professional impulse and by their justice-providing role, but to date have been elusive.